Amandla Stenberg has been promoting her new film 'The Hate You Give' and last night(October 4th) in New York, she attended the premiere at the Paris Theater. 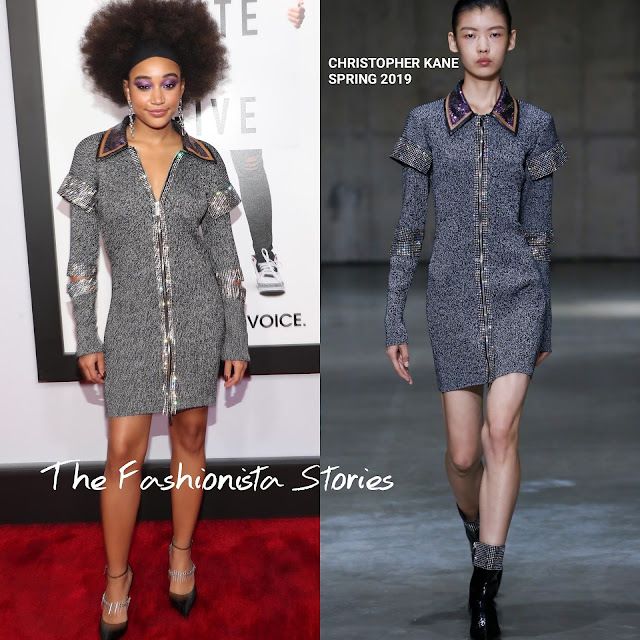 Working a look hot off the SPRING 2019 runway, she wore a CHRISTOPHER KANE grey metallic wool long sleeve dress, featuring a contrasting purple sequin, leather panel collar, rhinestone accents and cutout elbows. Adding a retro vibe to her look, she rocked an Afro. Instead of wearing sandals or ankle boots, she opted for embellished strap pumps. She finished up with a purple eye shadow. What do you think of Amandla's look?